Lean UX design is all about speed and getting things done. It’s also about getting the right things done so you’re not wasting your time (or your customers’ time for that matter). When it comes to completing a build-measure-learn cycle, it helps to have a few tricks under your sleeve to take a powerful approach to UX design to the next level. How can you reduce waste and boost productivity? This is where Lean design hacks come in to play. A few tricks up your sleeve can give your Lean UX design process the power boost it needs. So, what are these magical hacks we speak of and how can you use them in your Lean cycles to build even better products? Let’s find out. Prototyping better products starts today. Download Justinmind. Hold up a moment. Before you can deploy your most trusted and reliable tricks, you need to know what you’re aiming for. That means defining what success is for your product. 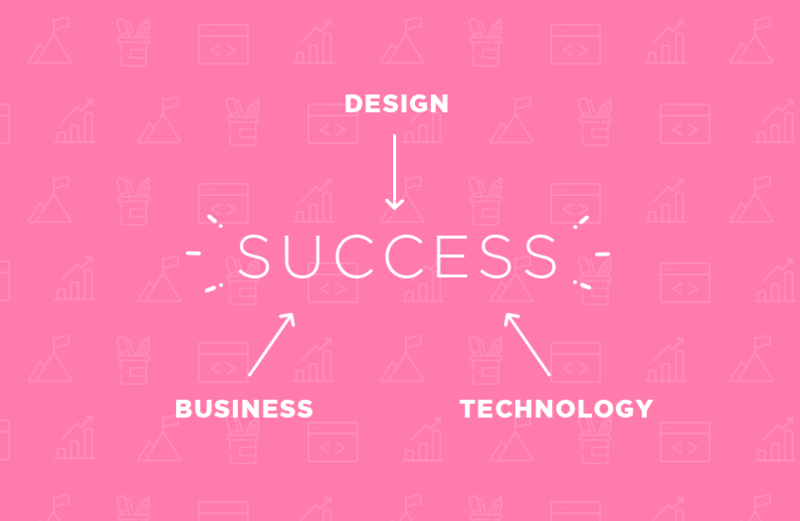 Sources at Product Creation Studio argue that product success is found at the intersection of design, business and technology. It’s there where product and UX/UI designers can start to understand the problems as well as the opportunities. These problems can be transformed into hypotheses which can be developed into metrics to be built upon. Ideally, your product goals should be centered around a critical event that you want users to complete, according to YML. When you know what success looks like, you’ll be able to create a map to get there. When you’ve got your map then you can start to introduce some useful hacks to get to your destination quicker and cheaper. When you set out to create a product, you want it to be successful. You’re not going to be the next Airbnb. The odds are stacked against you. But that doesn’t mean you can’t achieve an exceptional level of success regardless. With hard work, a stroke of luck and a few tricks success will come sooner. Let’s take a look at a few that you can boost your product success. Meetups are valuable for a variety of reasons. They give you direct access to people who are already interested in your product. You know that because they’ll have signed up to attend. It’ll be doubly confirmed when they actually arrive and you see them in person. Already you can begin to get some early validation for your ideas. But aside from being a useful tool to get validation, you can create a community of early adopters who can evangelize on your behalf. If you have a dedicated Meetup with a group of loyal people, you can use them to spread the word for your product. Plus, you can talk directly with them about what you’re thinking. It’s a great way to Get Out of the Building. Another use is testing out your MVP. Creating an MVP is vital if you want to understand where your product fits in the market and, crucially, if people want it. Pivoting might sound scary, especially if you’re wedded to a particular idea. But if you’re not getting validation, Lean isn’t upset about you changing. Just don’t get too addicted to pivoting because you’ll never be successful. One thing to note about creating a Meetup or a community is to make sure you’re not just doing it all for yourself. Be sure to listen, empathize and understand the people coming to the Meetup. Actively express your gratitude. If you’re only doing the Meetup for yourself or for selfish reasons, people are smart. They’ll pick up on that. Give back to the people who are helping you validate your ideas. Find out how these 3 UX researchers set about creating their own group. Advocating for the user is the mantra of many UX designers. Thankfully, Lean advocates for them too. Personas are an opportunity to create empathy. Empathy makes better products because you’re putting yourself in the shoes of your user. That means understanding their pain points and what makes them tick. Personas are excellent for their utility; they are a tool which can mitigate the need for expensive research studies and the best ones only need one page. Better to spend a few hours crafting decent personas than thousands of dollars you don’t have interviewing people. Proto-personas are like ordinary personas but they’re open to change. You might not have a lot of information about your users but you can take a few educated guesses. Think of a proto-persona as a persona that you have made without key information (because at this point, they’re assumptions). You could take a few people from your Meetup and transform them into personas. Then when you have more information as a result of ongoing research, you can adapt your personas by seeing which guesses were right and which were wrong, then adapt accordingly. To make a proto-persona, simply grab an A4 piece of paper, divide it into a quadrant. The first quarter should have a sketch of your persona (don’t worry, you don’t need to be the next Leonardo da Vinci, it’s only a persona) with their name. In the next quarter, you put behavioral and demographic information followed by pain points and needs in the next quarter then end it with potential solutions in the final quadrant. Head over to Xtensio to make your own user persona for free. Heuristics are rules of thumb. They’re not set in stone but can be used as a set of useful guidelines when navigating uncharted territory. If you’re making a product for the first time, heuristics can give you pointers on what to do and what not to do. Standards, like the 10 Usability Heuristics for User Interface Design, help anchor us to reality. The principles have been tried and tested countless times so we can guarantee that they’re a safer bet than that unfounded hypothesis you just whipped out of thin air. Don’t tie yourself too tightly to these heuristics. Even though those particular heuristics by Jakob Nielsen have been going strong since the mid-nineties, it’s worth remembering that they’re still broad guidelines and not specific usability guidelines. You will need to find out the specifics of any given problem through user research on your own. But at least by using heuristics, you’re on good footing. They’re a starting point. Using them will save you time and money because you don’t have to investigate whether or not error prevention is a good thing or not. If you want to dig deeper into heuristics, there are 2,397 available to you across multiple reports here. Designing an MVP is easier said than done. But they’re valuable for speeding up learning, decreasing waste and encouraging iterations. All too often though when we’re in a Lean cycle, we are prone to losing focus or forgetting the bigger picture. You have many options available to make your own MVP, from Justinmind to Unbounce. Where the MVP Canvas Template enters into the process is at the very beginning. It can be used to give your MVP creation focus and clarity. 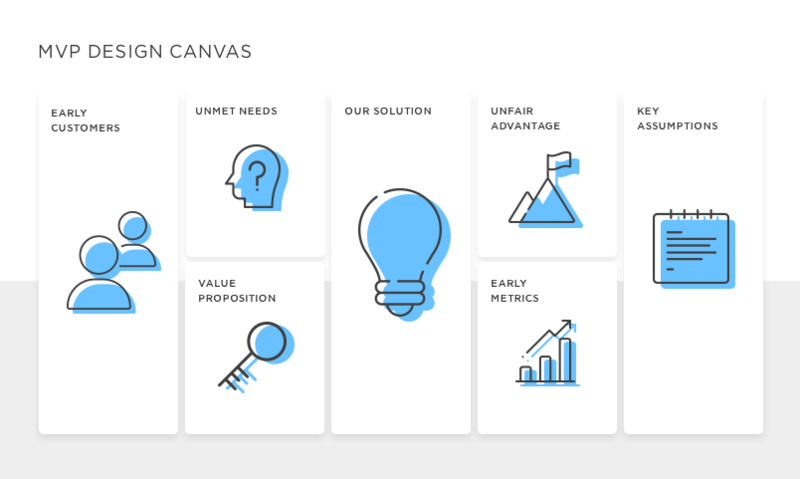 The MVP Canvas is a tool to help you clarify your product strategy and key assumptions. Amy Jo Kim, the startup coach, created the MVP Canvas. She found that the one-page canvas helped to articulate the strategy across the whole team. Here you write down your initial thoughts. You can use the canvas as your assumptions get tested and evolve. It’s a great tool to stay strategically aligned with your team. Yes, building and creating a successful product is hard work. Very hard work. Who has time for other people when you’re trying to change the world one user experience at a time? Why not let people know how hard it is? Using social media platforms like Twitter gives you access to an audience who you can share your thoughts, anxieties, fears and desires with. You can build meaningful relationships with other like-minded people as well as form potential business connections. Then there’s blogging. You can use blogging not only for your SEO efforts but to explain your process behind why you took certain actions or what test worked or didn’t work. This type of content humanizes you and people will be able to empathize with that. When they can empathize with you and your struggles, they’ll be able to relate and, maybe one day, turn into customers of your product. Start putting your product updates on a website like Product Hunt to get more visibility. It shows the community what exactly you’re up to and they can follow you to stay in the know. Getting out of the building is important when practicing Lean. Speaking to real people in the real world is valuable. But so is creating that sort of community online by finding out where your customers hang out and talking to them. Slack groups, Twitter chats and online communities are all ripe for these sort of connections. When you create a community of loyal fans and friend online, they will become your advocate. They’ll want to see you succeed and will do what they can with their own networks to help you along. Working Lean is about working efficiently and getting products into the market. These hacks will make you a more efficient UX designer. More than that, though, by following these tips, you’ll be a designer who is comfortable sharing their ideas and growing their network.